We are keenly aware of the importance of getting the food ‘right’. “We are constantly evaluating every aspect of our dining service and we’re not shy about innovation,” said Ken Butler, Sage Senior Living’s Vice President of Hospitality, “We’re always looking for ways to offer more variety, higher quality and freshness, and faster service.” Recently, Sage has initiated a sea change in the way we prepare meals. “Sous Vide” is French for “under vacuum” and, as a cooking method, it’s more often associated with fine dining than with a senior living community. The result is food that is more flavorful and succulent than it would be if cooked by high heat methods. Also, food under vacuum is anaerobic, meaning “living without air.” So, bacteria can’t grow, making the method an advancement in food handling as well as quality. Another benefit of the vacuum technique is being able to reduce seasonings. “We can use about 1/4 the salt with the same enhancement of flavor,” said DiBenedetto. “To learn how, we consulted with the best.” Butler brought in Bruno Goussault, whose consulting firm, Cuisine Solutions, has pioneered sous vide around the world. Goussard’s name is well-known in the culinary world. He’s personally trained hundreds in the technique, including many current Michelin three-star chefs. Goussard, whose company has offices in Virginia and Paris, counts Sage as an early implementer of the Cuisine Solutions method. 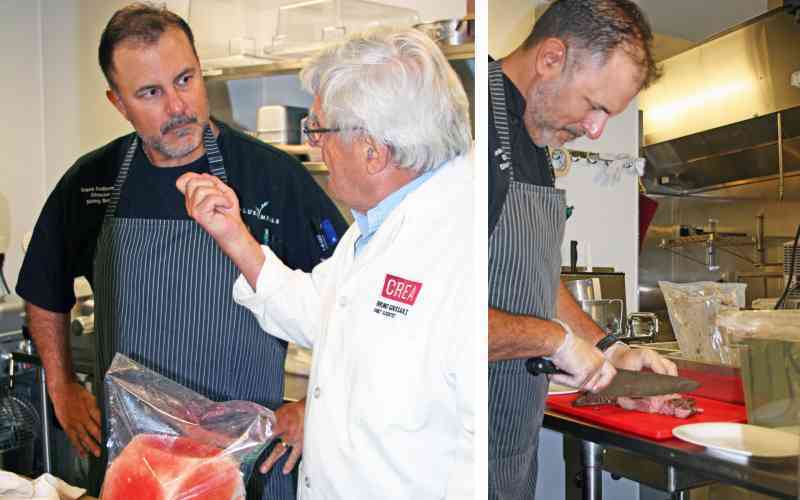 Philadelphia Inquirer food columnist Michael Klein came by during training to talk with Goussault and our chefs. You can read his article here. Call Marybeth Cannon and come for a visit: 610-640-4000.